What’s in a word? We use words everyday. Words name things, describe things, value things. Words protest, champion, exclaim! We know watchwords, passwords, words of honor. Words form the basis of verbal and written communication. Etymologists study origins of words. Languages add words as needed or as people adopt them into their culture. A rule of thumb is to know 1000 words in order to get by in a foreign country, yet the English language has approximately 1 million words! Words mean different things to different people (Vernacular). Designers put ideas into words. 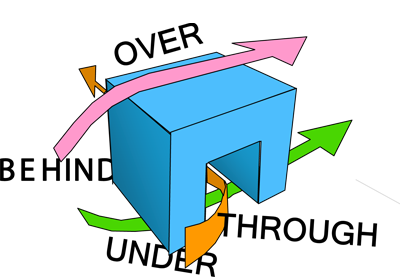 For instance, “wall” explains a surface in a room; “boundary” explains the wall as a visual or physical barrier; “edge” explains an artistic phenomena; “plane” Implies abstract geometry. Words begin to be the voice of the designer. Take two simple pictures from a magazine. Cut out the pictures and paste them on the top of an 8 ½" x 11" paper. Fold the paper in half longways. Name what you can see in the picture. If you can think of different names, list them, such as: car, auto, vehicle, transportation, machine, etc. Is a door just a door? Take a walk around your block with a digital camera. Take pictures of each front door of each building and house that you walk by. Print a contact sheet of your doors and below each door, write a word that best describes the door. Is the door an entrance, invitation, portal, threshold, menace, barricade, view in, keep out? 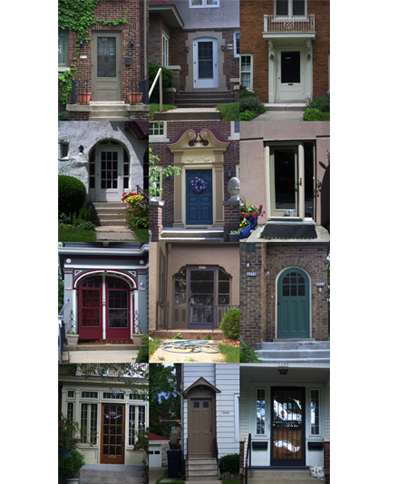 Take a look at these doors.Try to name the doors in your neighborhood by the message that the door conveys. Authors create onomatopoeia when they use words that sound like the action or object they are naming. The “Snap, Crackle, and Pop” of Kellogg’s Rice Krispies, “Ding, dong, the bells are going to chime,” and “Bang, Bang, Chitty, Chitty Bang Bang, the wondrous motor car, are all examples of onomatopoeia. Animal sounds, from the chirps and tweets of birds to the meow and roar of cats, provide other examples in which the sound and the meaning of the word is the same. Mechanical sounds and sounds of stormy weather are further sources of onomatopoeia. Using Wordle, create an Onomatopoeia Word Cloud! Choose 3 objects. Draw or photograph them and place them at the top of a piece of paper. On the left side of the paper, write the name of the object, letter by letter, vertically in a large font size. Beside each letter write a word starting with that letter that describes the object. There are many types of words. Take a look at the word types chart to explore different word functions. Words that name a person, place or thing are called nouns. Words that describe nouns are called adjectives. Action words are verbs and words that tell how, when, where and how much are adverbs. Articles are words that introduce and specify information about nouns; for instance a flower or an apple is more general in meaning than the flower and the apple. Compound words are two words joined together that combine to form a new mean; for example, butter and fly together mean an beautiful insect called a butterfly! 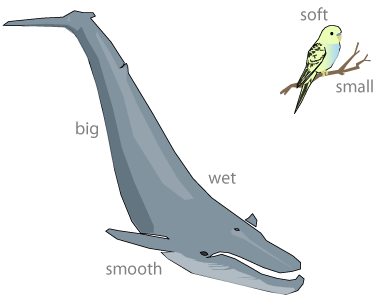 Conjunctions are words like and, so, therefore, because that help you join other words, phrases or even sentences together. Words can be connected into a sentence. There are different types of words that go together. Look at these sentence presentations. Label all of the different types of words. Write or copy a sentence. Label the different types of words with different color markers in your sentence. The study of origins of words is called? Do words mean different things to different people? How many languages are in use on earth today? What language is the most universal language? Munsell Color Chart: Why that color? TEDed Where do new words come from?